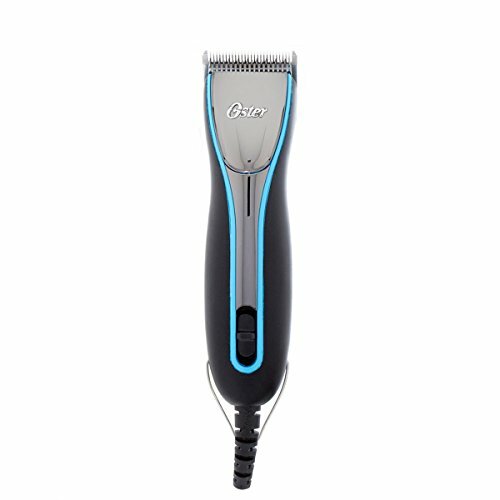 Keep your pet neatly groomed with the Oster A6 Cool Comfort Heavy Duty Pet Grooming Clippers. Combining a compact ergonomic design with a high-efficiency, precision-tuned, heavy-duty motor that runs at over 4,000 strokes per minute (SPM), these dog clippers feature an innovative drive system for an ultra-smooth, efficient cutting experience. These lightweight clippers weigh just 12.9 ounces and offer three speeds for ideal versatility. Specially designed faceplate keeps hair out while maintaining access to drive lever for easy maintenance, while vibration isolators centered around the motor help absorb vibration and noise for comfortable all-day grooming. The 12-foot power cord with pig-tail extension occupies minimal space on a power strip. Compatible with all Oster A5 detachable blades and guide combs, these heavy-duty clippers come with a detachable #10 CryogenX blade that is handcrafted from high-quality steel using a 12-step process. This results in a harder blade with a smooth-cut finish for enduring precision and performance.